GetGo Download Manager is a fully featured free download manager with integrated web video downloader. It can increase download speeds by up to 5 times, resume and schedule downloads. Error recovery and resume capability can restart broken or interrupted downloads due to lost connections, network problems, computer shutdowns, or unexpected power outages. Simple yet modern graphic user interface makes GetGo user friendly and easy to use. GetGo Download Manager has a smart download engine that can intelligently segment the file using multiple threads to accelerate your downloads. 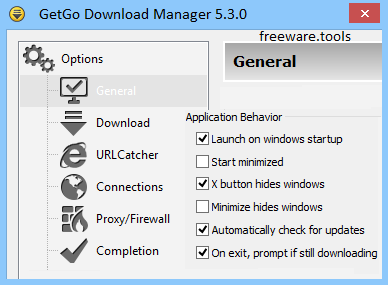 GetGo Download Manager is a tool that you can use to transfer files from any online source. Its abilities are best seen when handling large amounts of information. The user interface of the software is resembling that of other similar solutions, so you will easily find your way through it. In the "Downloads" panel you can view downloading, queued, failed, stopped, pending, scheduled, completed tasks, categories and history. Plus, you can check out information about a specific task in the "Properties" panel (e.g. percent completed, output directory, category, priority, time start, remaining and elapsed), while you can get a preview of the specific file. You can start a new downloading task by inserting the URL, file name and output destination, along with the download behavior (start manually, immediately, scheduled). You can also select a category, set the priority, split number, comment, as well as input user login information. The same method applies to batch downloads and leech downloads. Also, you can import and export URLs and change the interface theme. In the "Options" menu, you can configure the application and download behavior, URL integration, connection and proxy/firewall settings, categories, scheduler, passwords, sounds, and more. GetGo Download Manager uses a small amount of system resources, comes with a comprehensive online help file and manages to complete download tasks faster than other similar tools (at least when it comes to large files - e.g. 1.44GB in roughly 18 minutes). All in all, this software is a great download manager and is strongly recommend to all users, and it does not hang, crash and no errors are experienced when used.